Stephanie White was only 20 when the sudden, shooting pain in her gut knocked her cold. She was at work, a summer job before starting graduate school in physical therapy. Her boss found her on the floor and whisked her to the doctor. The days that followed are familiar to many young cancer patients: A surreal series of tests, each more invasive than the last, everybody saying: “We don’t think it’s serious, but let’s just do one more test.” Nobody can believe it’s cancer. But one radiologist, after a chest and abdominal CT scan and then a barium swallow exam that confirmed a mass in White’s fundus, pulled her aside and urged her to get a biopsy. His concern was key, because White’s gastrointestinal (GI) doctor saw the procedure as unnecessary — the history of occasional tummy troubles had seemed so ordinary. White told the GI she wouldn’t leave her office without an appointment for a biopsy. “I wasn’t going to take no for an answer,” she says. A few days later her obstinance saved her life when the biopsy revealed an advanced malignancy gnawing angrily at her stomach. Grad school disappeared from the immediate forecast, replaced by chemotherapy, a total gastrectomy (stomach removal), more chemotherapy, then radiation. No one should have to lug a chemotherapy pump along on their 21st birthday, but her girlfriends made it work. White’s out-of-the-blue cancer hints at a killer with an increasingly curious profile. “There has been a growing incidence of gastric cancer in younger patients,” says Adam Bass, an assistant professor in the Division of Cellular and Molecular Oncology at the Dana-Farber Cancer Institute in Boston, Massachusetts. “Very often it’s in younger women.” It’s one of many subtle variations of the disease, which can start in any part of the stomach. Generally, it takes a heavier toll on men and minority populations. African Americans are hit harder, but not Africans in Africa. Asians both in and outside the U.S. are at higher risk. Disease rates in Asia and South America are particularly high, and highest in Korea. Most stomach cancer — 71 percent — occurs in less developed countries. Because symptoms are non-specific and not easily diagnosed, it’s usually identified at an advanced stage, and with that compounded by the fact that treatment options are less than optimal, the disease is the third-deadliest cancer worldwide. “I think there is clear influence of particular environmental and even dietary and other exposures that influence these cancers,” says Bass. More cancer in young patients like White “raises some important questions” about the factors at work. Each little difference is another clue for medical detectives. Helicobacter pylori is an old bacterial companion of humans: Scientists recently found it in the gut of the 5,300-year-old Iceman. Yet H. pylori, which can lead to stomach ulcers, was mostly unknown to science until 1982. Barry Marshall, one of the Australian doctors awarded the Nobel Prize for discovering this link, actually gave himself gastritis by drinking H. pylori broth he had grown in his lab. In the years that followed, doctors teased out the relationship between the helix-shaped bacteria, stomach inflammation and gastric cancer. Worldwide, about two-thirds of people are estimated to be infected by H. pylori. In countries like Bangladesh, the rate is as high as 90 percent, while infection rates are lower and declining in more developed countries. In a 2000 study, H. pylori infection rates in the U.S. were reported at 62 percent for Hispanics, 53 percent for African Americans and 26 percent for whites. While we’re confident that H. pylori infection can lead to gastric cancer — antibodies that indicate past or present infection increase your likelihood of developing this cancer by six to nine times — it’s not a simple chain of events. For example, when germfree mice are infected, their risk of gastric cancer is low. Infect a mouse with a normal collection of intestinal microbes and the animals typically progress to cancer in seven months. “This suggests that there is an active collaboration between other microbial species in the stomach and H. pylori in a cascade toward gastric carcinogenesis,” explains Richard Peek, a GI cancer specialist at Vanderbilt-Ingram Cancer Center. More evidence of this comes from advanced genetic tools that have shown that gastric cancers contained more bacterial DNA than all but one other cancer. Yet this study found little DNA from H. pylori; most came from another common gut bacteria, Pseudomonas. Doctors aren’t rushing to stamp out H. pylori because there is evidence that childhood infections might help curb the development of allergic diseases like asthma. And it’s possible that H. pylori infection may actually help protect people from cancer of the esophagus, the tube that connects the stomach to the throat. In developed countries over the last century, incidence of gastric cancer has declined along with rates of H. pylori infection. But as gastric cancer rates have fallen in the U.S., rates of esophageal adenocarcinoma rose almost six-fold between 1975 and 2001. This subset of cancers is associated with reflux that turns into a condition known as Barrett’s esophagus; this, in turn, changes the lining of the esophagus, in some cases leading to esophageal cancer. While many factors are likely in play, there is speculation that the decline of H. pylori in the U.S. has somehow contributed to this sudden rise. “It’s not an absolute correlation, but in many areas they are tied together,” says Peek. Gastric cancer is among the more deadly cancers — less than a third of those diagnosed survive to five years. It is typically detected late, in part because people are so accustomed to managing the occasional upset stomach. White had stomach problems in high school and college, and attributed them to stress and diet. “I always thought that I had acid reflux,” she says. Stress, or certain foods, would set it off. She was prescribed reflux medication, but when that didn’t help she started tinkering with lifestyle factors and diet. It wasn’t a perfect solution. But like millions of people, she just lived with it, developed her own story to explain it and learned to manage the symptoms. “I just kind of toughed it out,” she says. “If we could get people diagnosed earlier, we could improve the outcomes for the disease,” says NCI medical epidemiologist Charles Rabkin. But that doesn’t mean involving a doctor with every upset stomach. Millions selfmonitor and self-treat because symptoms like occasional extra acid or stomach discomfort are extraordinarily common. “They are not specific whatsoever for gastric cancer,” he emphasizes. One of the reasons gastric cancer is so hard to detect is that there are often few symptoms, or at least few that raise red flags with patients. But in a large 1993 study, more than half of patients with gastric cancer reported weight loss and abdominal pain. After that the symptoms become rarer. One-third experienced nausea. Onequarter had trouble swallowing. There is some hope on the horizon for early screening. In Singapore, an early-detection blood test is undergoing final testing and could be available in that country by next year. Technology allowing a “liquid biopsy” of saliva for cancer testing could also be available in less than a decade — the technology is now in prototype stage for non-small cell lung cancer. Since we understand the risk factors for gastric cancer, there are some clear areas around which prevention can be focused — among them maintaining a healthy weight, not smoking, limiting salt and salty foods, eating a diet that emphasizes fruits and vegetables and discussing any family history of cancer with a health care practitioner. For those who do develop gastric cancer, surgery to remove part or all of the stomach, and possibly some nearby lymph nodes, is the only chance for cure, which is more likely when the cancer is caught in the earlier stages: 1 or 2. Chemotherapy — which may include platinum-based drugs such as the FOLFOX regimen often used for colon cancer, taxanes, the anthracycline epirubicin, 5-fluorouracil, irinotecan and/ or capecitabine — can be given before or after surgery in an attempt to boost cancer control, or as a primary treatment for gastric cancers that have spread to distant locations in the body, as can radiation therapy. 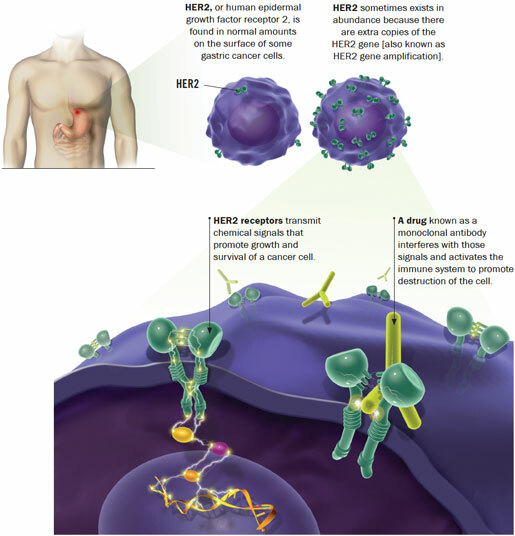 The targeted drug Herceptin (trastuzumab), initially approved to treat breast cancer, can be used in the 20 percent of gastric cancers that overexpress the protein HER2, and the monoclonal antibody ramucirumab can be used as a later-line treatment aimed at killing the blood vessels that feed tumors. But Herceptin only adds a few months of survival, and ramucirumab has also brought only modest improvements. Side effects of Herceptin tend to be mild, and can include fever, vomiting, weakness, cough, diarrhea and headache; ramucirumab can bring hypertension, diarrhea and headache. For about 20 percent of patients with advanced gastric cancer, tumors overproduce a receptor protein called HER2 (which is also associated with breast cancer). Before the H. pylori connection was made, gastric cancer was mostly understood by its location. The cardia is the region at the top of the stomach, where it connects with the esophagus. Cancer in the cardia is associated with reflux and obesity and metabolic syndrome. But non-cardia gastric cancers — cancers that don’t appear at the top of the stomach — seem to be a different disease. There is, for example, no link between that disease and obesity, but H. pylori infection typically resides at the bottom of the stomach. In 2014, advanced genetic mapping broke down the disease into four major categories according to the genetic changes made by the cancer. Generally speaking, the types matched up with location, except for one, which broke that pattern and offered a new and even more intriguing cause of gastric cancer: the Epstein-Barr virus (EBV). One of the most common human viruses, over 90 percent of U.S. adults test positive for current or past infection. EBV has been known to be associated with the rare cancers Burkitt’s lymphoma and nasopharyngeal carcinoma for more than 40 years. The link to gastric cancer was recognized more recently, but perhaps 9 percent of gastric cancers are connected to EBV. That makes gastric cancer the most frequent among the various cancers related to this infection. “Epstein-Barr virus-positive tumors were the most distinctive among those four subgroups,” explains Rabkin. It’s a puzzle, because EBV affects both cardia and non-cardia cancer, despite their different origins. “It isn’t obvious as part of gastric cancer,” he says. There is not a unified theory about how EBV promotes cancer, but it is thought that different pieces of the virus support cancerous processes. In the long run, EBV presents an interesting target for prevention via vaccination. “Presumably, if EBV were eliminated, you couldn’t get EBV-positive gastric cancer,” Rabkin says. For patients who do have EBV-positive gastric cancer, the viral fingerprint might present a treatment target. Healthy cells kill themselves when they reach the end of their lives, and cancer often disrupts that. EBV-positive cancers have a more active programmed death receptor pathway, and that is the target for a new class of immunotherapy called PD-1 inhibitors. Successful in melanoma, they are in numerous clinical trials for other forms of cancer, including gastric cancer. Doctors are hopeful about PD-1-targeted treatments, in part, because there have been few other therapeutic advances. “This tumor is proving itself to be a more difficult enemy than some other cancers,” says Bass. With many of these new targeted therapies, simply matching “the right drug to the right patient” can have a very meaningful impact. But so far, that isn’t working well in gastric cancer. “We have to develop more complex approaches to deal with these tumors,” Bass says. Last fall, White reached her five-year anniversary without cancer and celebrated by getting married. And instead of physical therapy, she changed course when her treatment was done: Now she’s a practicing oncology nurse, working in the same hospital where she was treated. Patients are agitated, as well. The advocacy group No Stomach For Cancer crunched the numbers and found that gastric cancer — the third-biggest cancer killer — receives less money from the National Cancer Institute than any other form of cancer. The genetic mapping of the cancer may help to close that gap. “The intention of this intense molecular study is to find treatments,” Rabkin, one of many contributors, says. The next step of that project will perform a similarly complex analysis of esophageal tumors. Bass suspects an important link between gastric and esophageal cancer. The curious connection between H. pylori, the decline of gastric cancer and the rise in esophageal cancer is just one clue to a relationship that may be more complex.